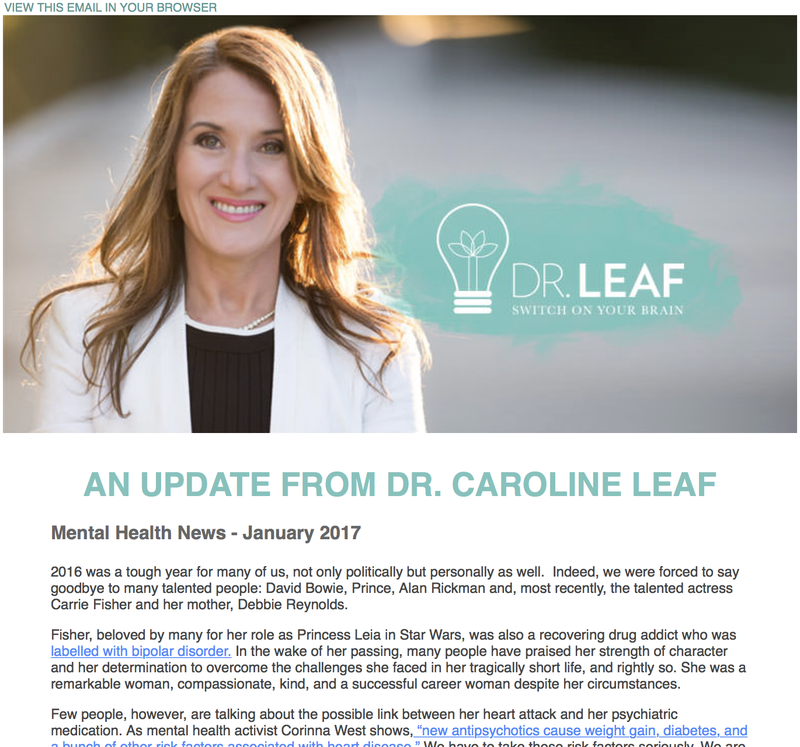 This entry was posted in Biological, Caroline Leaf and tagged anti-psychotic, autism, bipolar, cancer, Carrie Fisher, cognitive neuroscientist, criticism, diagnosis, dr caroline leaf, false teacher, heart attack, label, Princess Diana, pseudoscience by cedwardpitt. Bookmark the permalink. Thank you for taking the time to articulate your concerns with this latest post by Dr. Leaf! She went next level. I was outraged by her sweeping statements and to use the death of much-loved Carrie Fisher to carry her own agenda is truly mind blowing. Furthermore, how on earth can anyone in their ‘right’ mind make such a claim between her psychiatric medication and heart attack?? My jaw was on the floor when I read this. Actually in total disbelief. For someone who claims to be so well educated and up to date with science, this was a truly foolish comment! I could go on, but you have said everything I have thought. I feel especially angered about the potential damage caused to those taking psychiatric medication – so THANK YOU for clearing that up one. The use of medication when appropriate actually saves lives and helps to improve health and prognosis. For example. someone experiencing acute mania absolutely has to receive intervention (medication and usually an inpatient admission)…this is not dangerous or harmful. It’s ethical and humane. I would suggest that it even gives someone in this position or similar some level of dignity whilst they recover. Diagnosis is not synonymous with a ‘trapping’ label that Dr. Leaf states can “lock people in”…in fact, patients can feel relieved to give their experience a name, understanding their condition might actually be relatively common, and as you said, hopeful to receive some answers and go on to treatment. Your comments are always welcome Dr Kate! 🙂 Always great to hear from you. As someone who is diagnosed with bipolar and can not come off the medication to try something like ECT(I can’t sleep with out an antipsychotic now). I think Dr. Caroline Leaf has a point although poorly written. Hi Green Rockz. Sorry to hear about your experience with the medication. I hope that your doctors can find a better alternative for you. No drug is perfect, and unfortunately there are people for whom medications don’t work perfectly or at all. My issue with Dr Leaf’s article is not that she is discussing the issues with medications, but her conclusions are either inappropriate and/or flat out incorrect. Her article doesn’t help reduce the stigma of mental health, it increases it. She doesn’t add to the discourse about medications, she simply dismisses them. This is counter-productive in my view. 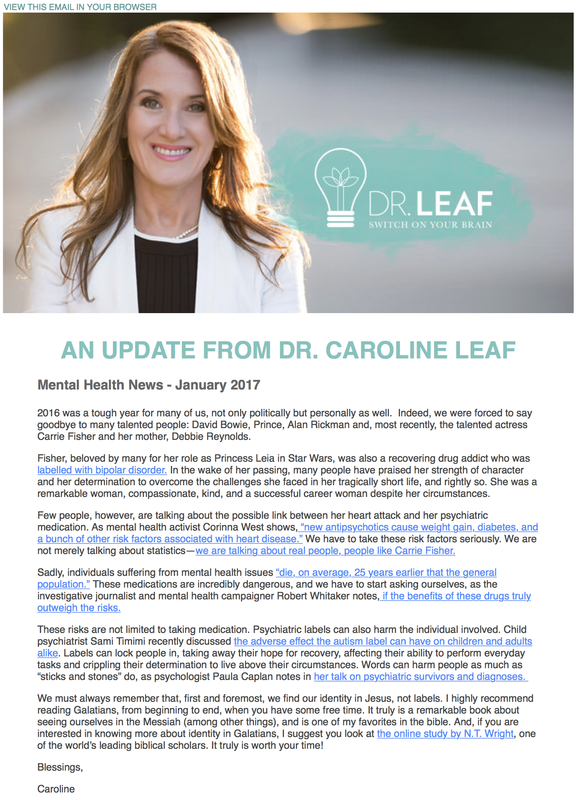 I understand you may see it differently, and that’s ok. We certainly need to have a discussion about the role of medications in mental health, but with an open mind, not a narrow one demonstrated by Dr Leaf. All the best to you. I’m assuming you have read the European Heart Journal that shows how people die 25 years earlier. That’s her point in my opinion. I have heard many claims like they are “throwing the baby out with the the bath water.” and stuff like. I was medicated for years in my parents home to young to determine or find out information myself and now I am stuck on medication that is no longer needed(My MD agrees). Mental Health is in my opinion a catch all for certain people in society. I’ve read Dr Leaf’s opinion but I think she’s wrong. She, like her heroes at Mad In America, are cherry picking to cast the medications in a bad light. There is a higher mortality rate amongst people with schizophrenia and other forms of psychosis, no one is denying that. Dr Leaf and MIA claim that it’s the anti-psychotics, and they point to studies like the one whose graph you linked to (Honkola J, Hookana E, Malinen S, et al. Psychotropic medications and the risk of sudden cardiac death during an acute coronary event. Eur Heart J 2012 Mar;33(6):745-51), but those statistics needs to be read in context. First, that 18-fold increase is an association, not a cause, and secondly it’s specifically the association between the combined use of phenothiazines and any antidepressant with sudden cardiac death during a heart attack. Looking at the table, the only statistically significant results were for old anti-psychotics, phenothiazines, tricyclic antidepressants and butyrophenones, none of which are first line medications for psychosis or depression anymore. Newer anti-depressants and the newer atypical anti-psychotics did not have a statistically significant association. And, like I said before, this study is looking at the association between sudden cardiac death in people having a heart attack, which is a very specific form of mortality. It’s not particularly applicable to everyone on the medications, so even if the 18-fold increase is rock solid, you can’t translate that statistic to everyone on anti-psychotic medications or anti-depressants. In their sample, the all-cause mortality was significantly higher in those people with schizophrenia who were never treated with anti-psychotics. Does this answer the question why there is a lower rate of mortality with anti-psychotic use? Not really, it’s just an association and doesn’t specifically prove causation. Does it show that we should throw anti-psychotics around like lollies, or that they’re wonder drugs without any associated harm? No, they are medicines and need to be used responsibly. It does show that while there are specific conditions where mortality may be worse with anti-psychotics, there is a general benefit overall to them and certainly they’re not the killers that Dr Leaf and MIA make them out to be. I am sorry to hear about the problems you’re having in your particular case. I understand why you’re not the biggest fan of the medications, but your case is a reminder that while the medications might be helpful generally, doctors need to be judicious in their use of the medications, not just prescribe the medication for the sake of it. Good luck, and all the best to you.